Posted on Sat 4 Feb 2012 at 1:52 PM PST. Filed under Recipes. While soy is to be avoided on the Paleo diet, when it’s fermented and its protein/lectins are broken down by the beneficial bacteria doing the fermentation, it becomes an acceptable ingredient. Tamari (wheat-free) soy sauce for example is used by many Paleo dieters, while natto (fermented soy beans), and soy-based unpasteurized miso paste are all considered very good for our health. Tofu on the other hand is very processed, and it still carries loads of agglutinin (SBA), so it’s not an acceptable food in the Paleo-sphere. 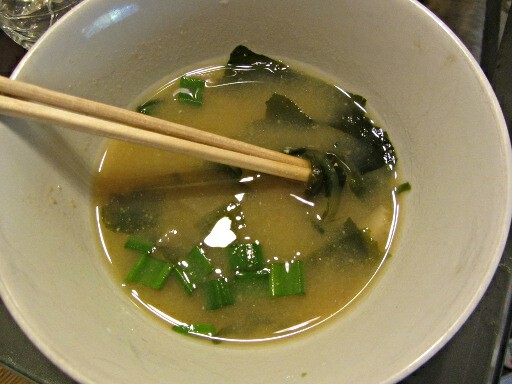 This miso soup is very easy to make, and very healthy because it includes various bone minerals, the miso live culture, and iodine & other rare minerals found only on sea-vegetables (φύκια). My husband usually dislikes miso soup in sushi restaurants, but he loved this one (he asked for a refill, rare for him). 2. In a saucepan add the bone broth and water, under medium heat. Using a tea cup, submerge it to the warm liquid and remove about 1/3 cup of it. Set aside the cup. 3. Add the sea vegetables and mushrooms in the saucepan and bring into a boil for about 3-5 minutes. Remove from fire.